Arabic Calligraphy, also known as Islamic calligraphy, is revered today as a form of art all around the world. It is given exceptional respect and esteem especially because its the first script that was used to write the Quran. May it be its contemporary cursive script of the thuluth, or the staunch. firm lettering of kufi, Arabic calligraphy is functionality, aesthetics, and readability in one package. When it comes to modern-day graphic design, Arabic calligraphy is not new to this either. With its different forms and shapes of writing, it makes logo design and website design standout like none other. Let’s have a look at its beautiful features and how it gains its deserved esteem through graphic art. This script of 28 letters, comprising only of 17 main forms works magic through themselves. 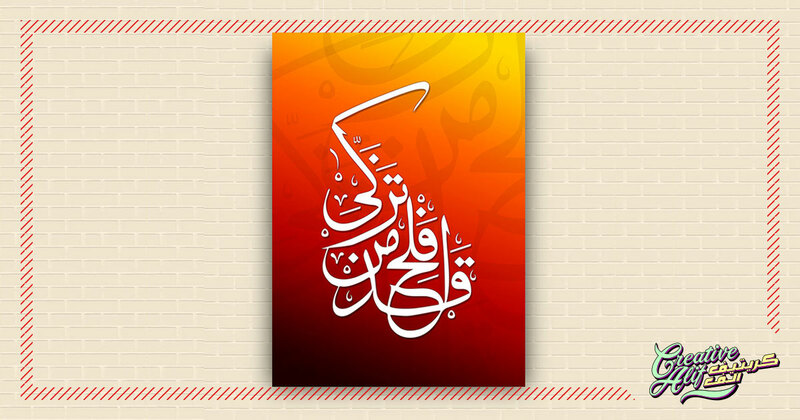 Today calligraphy art is used to decorate homes, create graphic arts, produce Arabic logo designs and website design and what not. There are a few reasons which make Arabic script a magical one to work with. This is by far the main reason for the popularity of Arabic language in the artistic world. Arabic letterings and script create the perfect balance with their dots, points, edges, and curves which makes up the best component for a design. Similarly, its form can be fitted into a wide array of shapes, designs, and forms, all without looking out of place or improper. This provides room for creativity to bloom on the canvas. As Arabs were basically nomadic tribes moving from one place to another, the script they used for writing went through a lot of cultural, regional and artistic variations. This helped early Arab artisans develop a variety of beautiful scripts like kufi, Diwani, thuluth etc. This is the reason Arabic calligraphy can give you a wide selection in decorative pieces for your home, workplace or web portal. The Arabic calligraphy or khatt, is quite malleable in nature. Majestic structures and shapes are erected throughout Islamic historical monuments all around the world. All of them showcase different types of formations. The Arabic calligraphy can be molded, defined and shaped into wonderful designs that will leave you awestruck. May they be in Andalusian mosques or in Egyptian ‘Jawameh’ Arabic calligraphy gives the life to every architecture in the Islamic world. Because of that, modern-day calligraphy can be molded and made to meet consumer demands and choices through graphic design. Concluding this discussion, it is evident that Arabic calligraphy is the perfect solution when you want your designing attributes to stand out. And if conjoined with the expertise of modern-day tech-savvy minds, it’s sure to attract many eyes. Arabic website design companies in Dubai offer Arabic calligraphy services with graphic designing to give you the best of both worlds. Check out the calligraphy design portfolios of such companies to visualize the artistic extent of beautiful Arabic calligraphy.